What is the light at the end of YOUR tunnel? Students will work their way through the website toward the completion of a MAP (My Action Plan). OSTC Student Support Team and Instructors will be monitoring student progress and assisting students in achieving their goals. To do this, OSTC will ask all student to complete a PRE and POST Career and College Survey. so the Student Support Team and Teachers can assist you in your planning. This survey will be open on September 6,2018. Please use your OSTC login information to take a short survey. Please answer all questions and be sure to give your first and last name. This information will drive your Program instruction and your MAP. ​The survey link will be taken down on September 14, 2018. Be sure that you are signing into your Oakland Schools Google Account. ​If you are logged in to your sending school account, it will say "Access Denied." MY NEXT MOVE is a quick interest inventory that may help you to discover your career passion. Click on the button below to take the inventory. Print the instruction sheet so you can follow each of the parts/tabs. ﻿VIDEO﻿- Click here to watch a short video about the goal of the Career Tree assignment. Investigate your career pathway within your cluster by filling out the sheet that your teacher prefers. ​Work neatly and put the completed copy in your portfolio. SCROLL below to check out the various Program Options at OSTC. 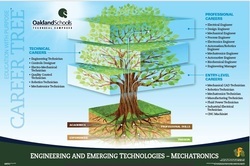 Each of them is represented by a CAREER TREE which identifies various careers associated with the program. The printed page following each picture conveys the 12 learning standards and the universal skills aligned to each program. Fee free to research colleges, careers or update your EDP. 2. Complete "MY NEXT MOVE" interest inventory, reference instruction sheet, if necessary. 3. Research Careers via the CAREER TREE Assignment then post your leaf on the classroom Career Tree. 4. Research College and Careers in Career Cruising (OPTIONAL). Know your personality traits, interests, values, strengths and lifestyle preferences, so you can see if the program at OSTC and the Career you are choosing aligns. Fill out the following sheet about yourself! To be sure that you are scheduled into the OSTC program that best aligns with your college and career goals, please review the Career Tree above. You will find a sampling of careers on the tree and then it will be followed by the following information. REVIEW all of the information carefully, so you are making an informed choice.